Before we had children, back when I knew everything about parenting, I was horrified when a mother would voice her desire to give her children back for just one night. Desperate for a family, I’d wonder why they even bothered having kids if all they wanted to do was get away from them (See? There wasn’t anything I didn’t know about motherhood). Well, after a day when I had both girls crying at the same time in Myer (okay, that was my fault; I had a tower of tops and dresses balancing on top of the pram and was desperate to try on something that would make me look 6-feet tall with a long neck, full lips and a flat belly), and then a wakeful night with Maeve for no apparent reason, the most exciting part of heading off to a market this weekend (I’m going to admit it) was it was ‘a day off’. I packed my market things and grabbed my handbag (yes, it still had the nappy, wipes, two of those fruit roll-up things that both girls hate, and the crayons – and wasn’t I glad of those crayons in the Myer fitting room the day before). And in the car I listened to the radio instead of Kasey Chambers. Don’t get me wrong, I love Kasey Chambers, but there hasn’t been a car trip for months that we haven’t heard her by request from a carseat in the back, so it was a nice change. Just as a side note: I did an excited little dance when I was singing the other day and Elsie told me, ‘You sound like Kasey Chambers.’ You don’t know how long I’ve waited for someone to tell me that. And I just listened to 774. I didn’t have to answer any questions from the back; I didn’t have to explain how many minutes is one minute, whether five minutes is a long time or a short time (which depends, by the way) and what the www is on the advertisement on the side of a truck (how do you explain that to a four-year-old?). But then we got to the market at the Go North Arts Festival. And everyting I saw made me wish Elsie and Maeve were with me. We were set up right beside the simplest and best children’s activities. 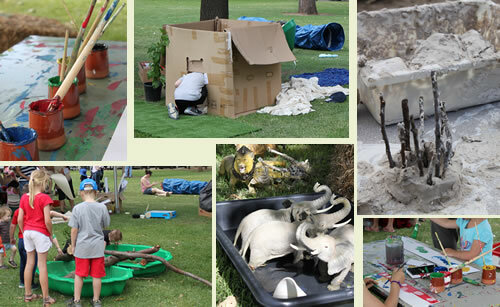 There was painting, cardboard cubby houses, clay, shell pools with logs and plastic turtles, and straw bales with potted plants and African animals. 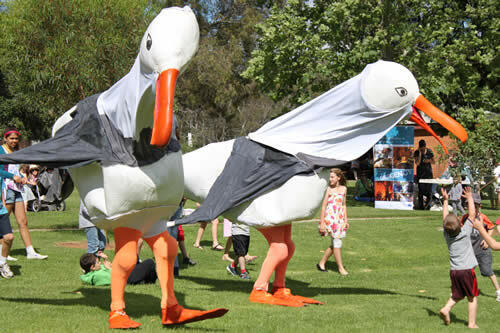 Elsie would have loved these seagulls. And our favourite part? Tumbarumba – Drums Percussion Voice and Dance. We loved their Brazilian and Reggae drumming and their interaction with the kids. Their gorgeous female dancer handed out clapsticks and shakers and the children copied her every move and followed her all over the grass like she was the Pied Piper. And I couldn’t wait to get home and have Elsie and Maeve follow me from the kitchen to the bathroom to the clothesline like I’m the Pied Piper.